Mason Randolph was having a bad day. He was part of a team that tested new technology - technology nobody was supposed to know about. On a test flight for a new plane that was about to be unveiled, a drop went wrong, and he found himself falling over Area 51. With well honed skills, he managed to survive...only to find himself under arrest. Jill Walczak knew who Mason was, but where he was caused problems. She was investigating a serial killer, and Mason just happened to appear somewhere he shouldn't, and wasn't giving a good enough explanation. She didn't much care for the aptly nicknamed "Smooth" aviator, but she was about to spend time with him. Jill needs to keep an eye on Mason, professionally of course. There are too many accidents, and she needs to follow each lead. She sees his moves first hand, but she knows better than to believe his lines. She might be attracted to the man, but she'd heard all about him, had even seen him on the base. She needed to keep her mind on the case and the facts, and not on him. But with each moment with Mason, that proved ever the more difficult. 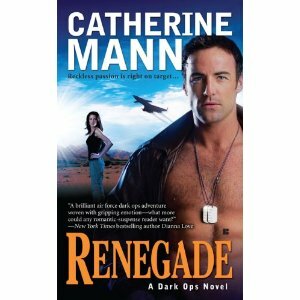 Renegade was another exciting edition to Catherine Mann's Dark Ops series. Jill had a distinct well formed opinion of Mason at the beginning of the story, and it was a delight to learn about the real man behind the attractive facade. I enjoyed the alien aspect, including their evening at a local haunt. It was fun visiting with familiar characters, and I look forward to seeing them again...hopefully soon. FTC Disclaimer: I did receive a copy of the book from Reader to Reader for review. However, this website only posts "good" reviews. If I cannot post a positive review, I notify whoever has provided me with the book/ARC/ebook.